Have you ever had one of those days? Of course you have! The kind of day that makes you believe in Murphy's Law. Well, maybe it hasn't been quite THAT bad, but really? What a lousy day today was! I had planned all week to go to the movies today with two friends. When I woke up, I had texts from both of them saying they couldn't go. So, I started doing chores and didn't even look at my phone for a few hours. It was on silent, so I didn't hear when a new text came in. When I finally looked at it, there was a text from one of them saying she could go after all, but by the time I looked at my phone, the movie was actually starting. Such stupid luck! So one of my friends got to see it, but I didn't, and I'm the one who planned it in the first place. And the hubz drank a little (read: a lot) too much at the martini party last night (which was so much fun). But he knocked over some water because he had drunk too much. And it ruined my son's Sony camera, the one he bought with his own money. Hubz will replace it, but stilll... Just one of those "thangs." Hubz didn't listen when I told him of my plans for today, and he didn't tell me his plans, so I had to do the grocery shopping alone, which I hate, and we ended up not being able to have dinner together. And I had to be the homework police since both my kids had homework (yes over Halloween weekend). And I tried to order KFC for dinner, but they only had original recipe, which I don't like, so I had to make a sandwich for dinner. So glad tomorrow's a new day, a new month! Okay, so the picture is a little crooked! My daughter took it, but you can see these goodies! Now, let me tell you this... I DO NOT LIKE Baked Lays of any kind. So, I was wary, but I have to say that I LOVE these White Cheddar Cheese Baked Puffs! they were gone so fast! My husband liked them, too. My daughter didn't like those, but she enjoyed the Snackimals. The High Fiber Cereal with Cranberry was also yummy! And my oldest step-daughter likes the fact that the Multi-Grain Cereal is gluten-free. Where can you get these tasty cereals and snacks? Visit Barbara's Bakery on the web or find them on Facebook. You can print a $1 coupon at their website or enter their makeover contest. Barbara's Bakery products are also available at most Randall's and Safeway stores. This post was written as part of a campaign for Family Review Network and Barbara's Bakery who provided the product for review. How does all this connect? Is it all part of some crazy Halloween scheme? Nope! These were all part of the crazy dream I had last night. Strange, huh? And odd what we remember upon waking! My sixth graders were required to read this book over the summer if they were enrolled in advanced social studies this year. I finally finished reading the book last week. I wasn't impressed. The main character is a young girl whose family is trying to get to America from Ireland during the potato famine. I didn't feel like there was enough historical background information to convey why it was so important for them to leave their home country. The characters were also one-dimensional. Their arrival in the United States was anti-climactic. I wasn't on the committee that selected this book, and I hope it is not on the list again next year. Candles! I love them! And these new Glade scented oil candles in the pretty, glass containers are adorable. They will burn for two-three hours, and when the oil is gone, the flame goes out. How handy is that? Plus, you can buy refills instead of replacing the entire candle. This candle you see? The fragrance is clean linen, and I love it! It also looks pretty in my bathroom. I just find candles to be so relaxing. Also, between September 1 and October 31, 2010, fans can create their personalized glass holder for the chance to win $10,000 and have their design sold in stores nationwide! And it's quite fun using the design tools! I chose a simple heart on a lavendar background. Here is your chance to win a Glade Scented Oil Candle! Random.org will help me choose a winner soon, so enter no later than midnight on October 21st, CST. This giveaway is only open to US residents. Please make sure I have a way to reach you via email. 1. The mandatory entry is to leave a comment on this post. More entries! Leave a separate comment for each one. 2. Tweet this giveaway. Leave your Twitter link in your comment. 3. Leave a comment on any non-giveaway post on my blog. Come back here and tell me which post you commented on. 5. Visit my blog frog community and leave a comment on a post there. Come back here and let me know which discussion you joined. 6. "Like" Glade on Facebook. Leave a comment here with your facebook name. 7. Visit the Design Contest and submit an entry. (You can submit up to ten designs.) Come back here and let me know what your design looks like. This review was written on behalf of Family Review Network and SC Johnson/Glade who provided the product for review and giveaway in exchange for my honest opinion. It's been six years today since you left this world. It's not the same without you, and I don't think I will ever get used to it. Sometimes I think I see you, but it's only someone who, at a glance, reminds me of you with a certain mannerism, height, hair color, etc. It's always disappointing when I realize, "It can't be." I dream of you sometimes. In my dreams, you come back to us. Then I wake up, and the dreams are shattered. I remember the day you passed, where I was, what I did, what I said. "Is he awake yet?" No. "Why not? When will he wake up?" I still wonder that. Or rather, when I will sleep. I hate that you had to be in that cold, impersonal, sterile hospital, but I know that your spirit was already gone by then, and I do take comfort in that. I don't remember the days following your passing. I vaguely remember the funeral and the graveside service. I remember your Masonic brothers who were such a support. They still think of you, too. And I remember a few days later, hugging my dear husband, who was barely hanging on as boyfriend at that time, and while I was seeking comfort, he was cheering on the Astros on the TV behind me. Funny, the things we remember. And those things we forget. Not a day goes by that you're not thought of and missed. There is something every single day that reminds me of you. Today, it was cooking bacon, among other things. My heart hurts that my children don't have their Papaw. You were such a positive influence in their lives. They miss you, and I so wanted you to see them grow up, succeed, and become responsible adults. Daddy, do you remember when I thought you could fix everything including a broken record? You could! In my eyes, you could do anything! Mom is so lonely without you. She talks non-stop to anyone who will listen. She says I have never completely grieved, and she's probably right. I wish I could - just let it all out - but I can't. I think if I went back to that crying place in my soul that I would never get out of it. The mental trauma is just too much to handle. The world hasn't been the same since you died. It never will be. Everything is pretty much the same from day to day. I try not to let myself think about it, just block it out and pretend like everything is okay. But it's not. 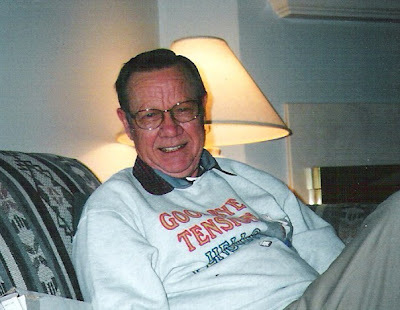 I just miss you so much, Daddy! I love you! Cold and flu season is upon us! 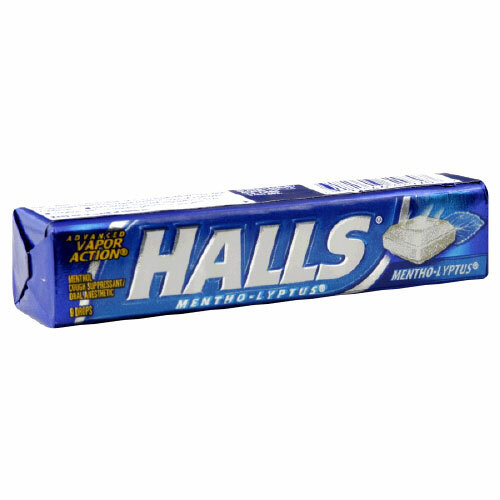 Do you have your Halls? Halls has been a trusted name in cough and cold-relief products for... I don't know how long. A long time! My favorite Halls product is the cherry-flavored cough drop with mentholyptus. That vapor action helps me breathe! They also make products specifically formulated to moisten your mouth, to soothe a sore throat, and drops with echinacea, zinc, and vitamin C to boost your immune system. Many of their products are available in a sugar-free version. I also suffer from allergies. Did you know that Halls drops are an excellent complement to your regular allergy medicine. While you are waiting for that allergy med to kick in, pop in a Halls for 10-second relief of cough or sore throat. Giveaway! Two of my lucky readers will win TEN (10) sticks of Halls Cough Drops. This giveaway will close on October 16 at 11:59 PM. US Addresses only. Please make sure I have a way to reach you via email. 1. Required entry - just leave a comment on this post! Easy! Want more ways to enter? 2. "Like" Halls on Facebook. Come back here and leave your screen name. 3. Visit the Halls website. Come back here and leave a comment telling me something you learned. 4. Tweet this giveaway. This can be done up to once per day. Leave a comment with your Twitter link for each entry. 5. 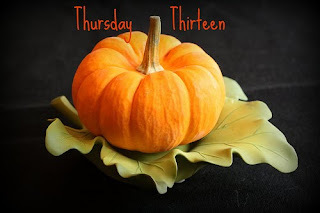 Visit one of my non-giveaway posts and leave a comment. Leave a comment here for your extra entry, too. Halls - Relief in 10 seconds! "This post was written for Family Review Network & HALLS who provided the complimentary product for review and giveaway in exchange for my honest review." Thank you to everyone who prayed for my mom! Her surgery Tuesday was successful, and good news, there was no cancer in the lymph nodes. The doctor also took some preventative measures for her potassium and sodium levels, and so far, that hasn't been an issue, and neither has the reaction to the pain medications because she has had a novacaine pump and no oral pain meds. We are going to make it through this one without a near-death experience! Or, so it appears. I always hate to have my hopes up because the last two times she had surgery, she was fine the day of, and the day after, so tomorrow will be the true test. If all goes well, and I'm continuing to pray that it does, she will get to go home Thursday evening. Since she lives alone (Dad passed away almost 6 years to the date), I'm going to go stay a while and help take care of her. I know she isn't going to feel very good. That's to be expected. Thank you for your concerns and prayers. It means a lot to me. And if you want to experience some more goodness, how about visiting Our Dandelion Wishes for her "Queen for a Day" post. Fun! Please pray for my mom. She will undergo a double mastectomy this morning. She had a knee replaced one year ago, and she had a thoracotomy for lung cancer 22 months ago. Both of those surgeries created terrible reactions, and I just pray this one is different. We almost lost her both times, and I just hate that she would have to go through that stress again, not to mention how it makes my sister and I feel. We just lost our dog, and I really hope I don't have another reason to cry any time soon. Please, Mom, pull through with flying colors! I don't want to lose you! Please, if you're a praying person, regardless who you pray to, please remember mom and her doctors. Thank you.